For the period ending November 10, 2017 ... New DVD and Blu-ray selections added to the DVD & Blu-ray Release Report's database. 11/07/17 — Released Drive. Play. Sleep. 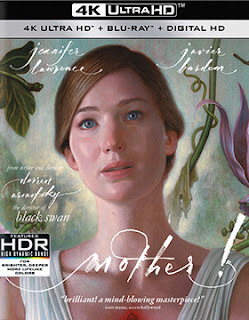 Paramount Home Media Selects Dec. 19 For The Home Entertainment Release Of Writer/Director Darren Aronofsky’s mother! Writer/director Darren Aronofsky’s silver screen “Rorschach test,” mother!, starring Jennifer Lawrence and Javier Bardem, will be making its way to the home entertainment marketplace on Dec. 19 as a three-SKU array of products … so says Paramount Home Media. The ARR works out to 95 days and box office receipts were $17.8 million. Planned for distribution are a DVD edition, a Blu-ray/DVD Combo Pack and a 4K Ultra HD/Blu-ray Combo Pack. Is mother! a horror film, wrapped in insanity? An allegory, where you must ferret-out what each character represents? A Felliniesque tale of the bizarre? All of the above … none of the above! 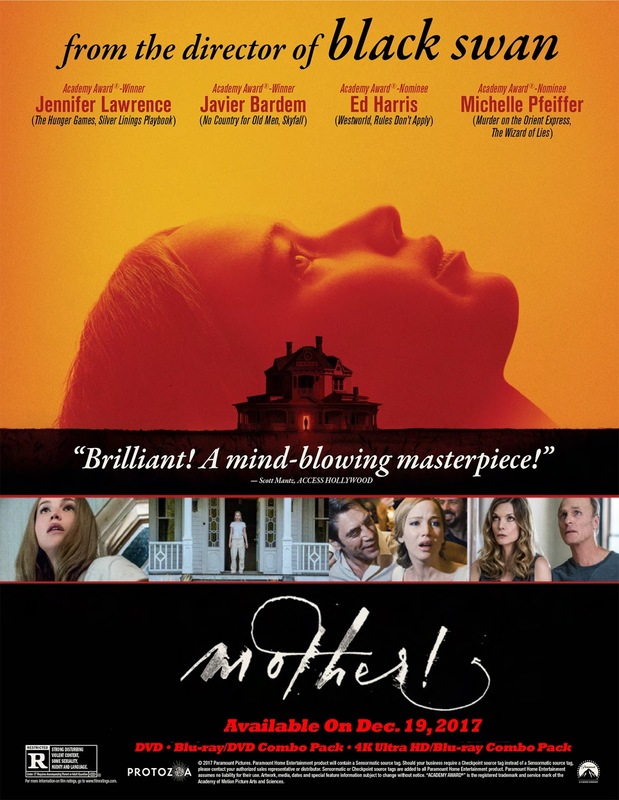 If you are into the cinema of Alejandro Jodorowsky, David Lynch, Federico Fellini and Guillermo del Toro (among others), then Darren Aronofsky’s mother! will be a visual feast; you will be right at home And it is … a visual feast. Jennifer Lawrence is “mother” and she lives in a picturesque, but remote, home that appears to have been recently burned, or perhaps even destroyed. She shares this home with “Him” (Bardem’s character), who magically restores it with some sort of crystal. Lawrence sets about to refurbish the house and it is beautiful. 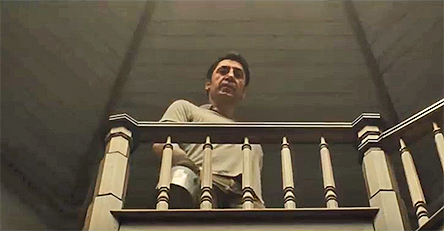 One evening “Man” arrives (played by Ed Harris) and Bardem invites him to spend the night, which sets Lawrence’s character on edge. The next day “Woman” shows up at the door (Michelle Pfeiffer) and she too is invited in by Bardem’s character. Without giving too much away — and it is really left to the viewer to interpret what is taking place — more people arrive, things get very bizarre and “mother” becomes increasingly unhinged. 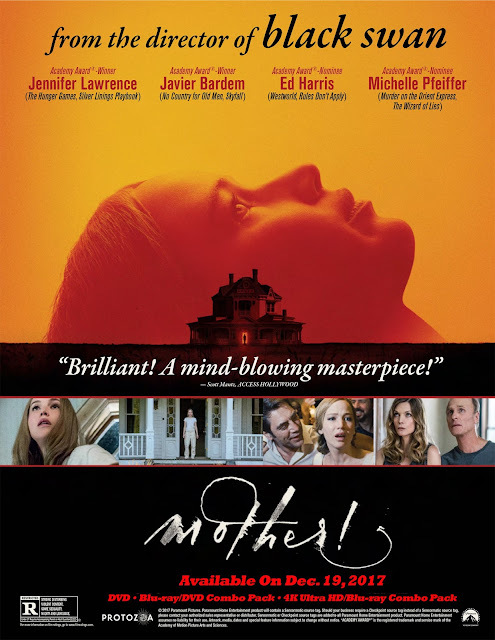 Labels: DVD and Blu-ray Release Report, Paramount Home Media Selects Dec. 19 For The Home Entertainment Release Of Writer/Director Darren Aronofsky’s mother! Oscilloscope Laboratories will be opening the New Year with DVD and Blu-ray editions of French filmmakers Valérie Müller and Angelin Preljocaj’s film adaptation of Bastien Vivès’ graphic novel, Polina. The street date will be Jan. 9, which yields an ARR of 137 days … box office receipts for the film’s arthouse theatrical run currently stand at $165,203. Polina (Anastasia Shevtsova) is a dancer. A dancer with all of the techniques learned in a lifetime of preparting for the Bolshoi Ballet. She is a beauty with haunting eyes, but she lacks one important thing … the spark; the soul of a dancer. Teach a cyborg développés, arabesques and pirouettes and you have a dancer without the soul of a dancer. Polina is such a dancer, technically brilliant, but programmed “in body” to be so, but not in spirit. We see her first as a child, as then as a teenager, she is now ready to fulfill her parent’s dreams of being with the Bolshoi Ballet. And then she meets a visiting French dancer by the name of Adrien (Niels Schneider), and on a simple “dancer” date — they don’t go to a movie or out to dinner — the pair instead attend a recital of modern dance intrepation and Polina’s world comes unglued. 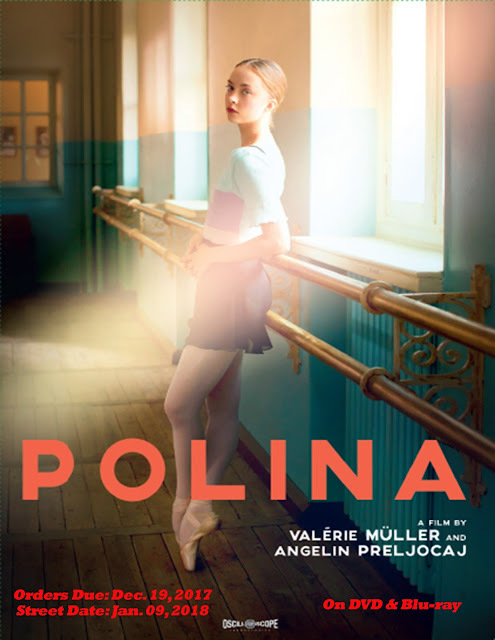 In a stunning moment of clarity, she abandons Mother Russia and the Bolshoi and moves with Adrien to Paris, where she meets Liria (Juliette Binoche), a dance instructor who opens Polina’s eyes to dance as a living thing! Polina is presented in French, with some Russian, and English subtitles. As a bonus feature it includes a behind-the-scenes making of featurette.